Robert Fleming, the National Army Museum’s Templer Study Centre Manager, discusses the First World War campaign in East Africa. 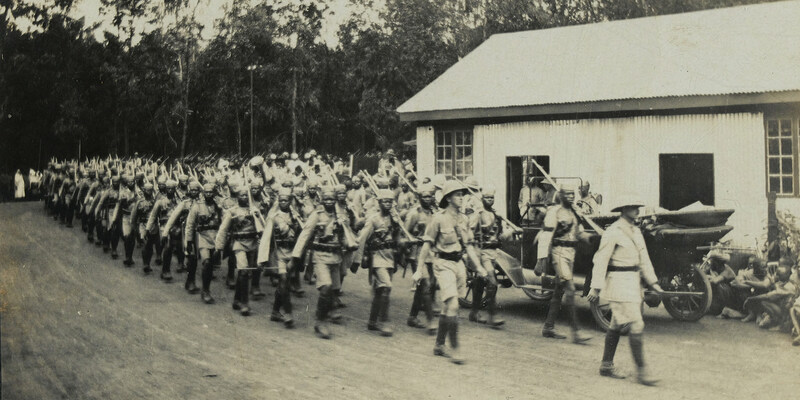 The First World War reached many of Europe’s far-flung colonies, including those in East Africa. The fighting there was brutal, but the environment was even more deadly. Soldiers marched across hundreds of miles of plains, swamps and jungles, and faced constant threats from heat, tropical diseases and parasitic bugs, such as the tsetse fly, as well as ambush and combat. Britain committed £200m and more than half a million men to capturing and defeating General Paul von Lettow-Vorbeck’s well-trained Askaris. But the German commander led the Allies on a merry game of cat and mouse for the duration of the war, avoiding defeat to the very end.